This Choice burgundy full length bib apron with pockets is a stylish alternative to plain bib aprons. With a curved silhouette and strong, low ties secured to a narrow bib, it will look great on your baristas, bartenders, or bakers. This apron offers a sleek, clean look as it is made of heavyweight deluxe poly / cotton blend. 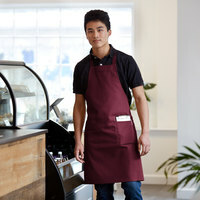 This burgundy apron provides a durable, full coverage solution to protect your and your staff's clothing. The color on these are great, throughout numerous wash cycles and cleanings they remain durable and vibrant which is a great value for the price. at my restaurant color we represent burgundy color. we all have to match. it is very durable and it is very inexpensive. i would buy again. THIS IS A VERY NICE LARGER APRON, THAT GIVES DECENT COVERAGE. IT WASHES UP VERY NICE AND THE COLOR IS VERY NICE,THE POCKETS ARE GREAT,TOO. Well made with good material, the pockets are sewn on good and work perfectly with it. Held up for a year so far with use and washing. The aprons look just as they are pictured. However, when I washed them, they bled a lot and stained other laundry. You have to wash them alone, or wash them with other burgundy linen. Thank you for your feedback! We are sorry your Choice Burgundy Full Length Bib Apron with Pockets - 34 inch x 32 inchW did not meet your expectations. If you have questions about the product you purchased please contact our Customer Solutions team! It is very good material, the price is excellent plus it has pockets. You don’t feel it big, it is very comfortable and the color is pretty to use on special occasions. This apron is very versatile and serves its purpose. It was very inexpensive and is a great value for that. Some stitching started off poor/coming off of one of them, but I washed them several times and they are holding up well still. Thank you for your review, Sara! We are sorry this Choice Burgundy Full Length Bib Apron with Pockets - 34 inch x 32 inchW has not worked well for you. A Customer Solutions Representative will contact you soon! Great quality aprons. Resistant to some stains pretty well. The better of any aprons we have tried. Hold up to some heavy duty washes a few times before beginning to see wear and tear. These aprons are the best I have purchased in the 4 years of running this particular restaurant. Most are either too lightweight or to heavy. These also wash up very well. They get a thumbs up from me! The apron works well and is made of a nice thick material. Not much else to say about it. Just be warned, the apron is long. If you're vertically challenged like me I would definitely go with a shorter length. The choice brand apron with pockets works so well for me. In one pocket I put my cell phone and in the other hand towel which makes it easier for me to access everything. We ordered these for our servers to wear at a fundraiser, and used an iron-on transfer to put our logo on the bib portion. It worked great --- the fabric also seems resistant to stains and water drops, which was a nice bonus for our alcohol servers. Three years later and we're still using these aprons. wow these aprons are fantastic and are great for storing utensils and its well made because the fabric is very strong and durable. very nice color too. This Choice Burgundy Full Length Bib Apron is of such great quality. The burgundy color looks exactly like the color in the picture. The pockets make it so great for a waiter or cook to keep their notes or pens. Great quality apron with 2 separate pockets for easy storage. The burgundy color is very nice and matches well with my kitchen accents. The fabric is strong and tough and is able to withstand washes very well. My only gripe is that the chest section is a tad low, but nothing too frustrating, really. The apron also has long waistcords so you can tie around the front if you prefer it like I do. This apron is a much better value on WEB than other sites which cost around 4x as much. These are of great quality. Exactly as described. I would highly recommend for a bib apron. The price is great for the quality you receive. I love the material and also how well it fits most and the pockets are deep enough to hold utensils and also pens and note pads. And comes in a variety of colors. I absolutely love this product! This choice burgundy full length bib apron with pockets is great for our restaurant cooks and preppers! These are great quality! I got this apron for my boyfriend and he says it's pretty good. There's plenty of room in the pockets, and the material isn't uncomfortable. Adjustable apron that is made of good quality and also has a tie string at the back. It really helps having two deep pockets in the front for utensils and instruments. Nice looking apron. The pockets are spacious and well-placed. The length and fit feels comfortable and strings are long enough. Overall, a sleek looking apron and nice that the colors can match the theme of my cafe. The fit and feel of this apron is great. The quality and the price is even better. I will definitely be buying more of these. Okay, I bought 3 colors of these, the white the black and this color - they are all good and as you can see the price is really good too! Love the burgundy color.. Coordinates perfectly with the colour scheme of my restaurant. Really adds class. The full coverage is great to cover Street clothes and protect them from splatters and spills. I love the color of this apron so much that I may have to order more. This full length bib apron helps keep clothes clean, and most foods do not show up easily. It also cleans up well, and keeps color after washing. These are nice looking burgundy aprons, but they bleed a lot in the wash and the ties tend to come off and need constant reattachment. Would rather spend more on a better apron. This apron is available in multiple colors, but all share the same wonderful functionality. Long, full-coverage. Pockets for serving utensils or napkins, other personal items. At this price, it's easy to get 2 or more so that one apron can be worn while another is being cleaned. We've bought these aprons a couple times. They get used daily and washed daily and they last for years. You can't find a better price. Nice aprons, comfortable easy to clean. These are the aprons I wear when company is here because I don't bleach them. But often I am back and forth in the kitchen and prefer to have on an apron. They are attractive and durable. Nice material and quality apron. Good fit and easy to clean. Holds up to regular washing. Tie strings are a bit shorter than other aprons. We are happy with our purchase of this apron. It is comfortable. The pockets are convenient. It feels like it's a good quality fabric, and not cheap. This is such a good price and what a great value. The apron is very heavy duty and the pockets come in very handy for all of my employees. These aprons are very heavy duty and last quite a long time. I bought several colors and all of my staff really look great in these instead of your basic white aprons. Thanks! We've owned ours for a few months now, and it's served admirably. The fabric is strong, and the stitching well done. Trips through the Clothes Washer don't harm it. Would buy again ! My staff enjoys sharing this well made apron. It helps keep their clothes clean and looks good on them. It is well made and holds up to laundering. These aprons are practically stain proof. I am a messy baker, and love to get batter all over myself, but these aprons allow the mess to be wiped away. They are easily washable and perfect for people xs-xl! Great for baking and cooking, but could be used for housework and small jobs around the house! I have ordered more of these aprons after the first I got. The apron is well made and the material is thick. The aprons look professional and hold their color nice after many washes. This is a nice, heavy apron at a great price. I've embroidered our logo on it and washed & washed it, and it still looks great. Very nice, heavy duty apron. It's made from a very durable fabric that resists staining and washes up well every time. Nice long apron strings that give you enough room to tie in front. These aprons are the perfect size and length, saved a lot of money too on them. Highly recommend for restaurants since they hold up very, very well no matter how many messes or washes they take! I like the choice of color and the quality. Thank you for having such great prices and the very best quality. Ever since I became a chef I had always wondered why they wanted us to wear white. As soon as I could I switched to darker color jackets and aprons. They don't show the stains...This product fits the bill perfectly. I give them a firm 5 rating! !